posts...the male that would not open his eye last week, is fine this week. The eagle nest that had a goose in it, still has a goose in it. Boy that is going to be a big jump for those goslings...don't know how they will survive it. A suicide leap. I don't want to think about it. I found several more nests that have laid eggs and I read several more bands. I also observed a female standing on the nest edge food begging...and when the male finally returned, he sat down at first as if he was incubating. But the female had never been seen in incubating posture. After about five minutes he got up and started preening. I mention this because sometimes these birds do sit down when they do not have eggs to sit on. It was quite windy for a while today, perhaps that was his reason for hunkering down. Anyway, I have learned that you do have to watch for a while before you conclude that they are incubating, and I like to see both birds taking their turn at sitting...then you know there are eggs. I have already found a change in birds on one nest. A banded female was replaced by an unbanded one. There always seems to be a game of musical nests in the early days of the breeding season. I spent several hours at another nest trying to ID the male...but he never showed up. Hmmmm. In fact the female chased away another unbanded male, so I am wondering if my timing was just bad or if something has happened to her banded male. So now I get to have a beer, don't I? I checked 23 nests today...8 were empty, and that included 2 that have never been used and two that havent been used in many years. I found one pair incubating and read 8 bands. I did see some extra ospreys at several nests, so they are still looking for territories. On one nest an extra female arrived on the nest, stood side by side with the resident female and they food begged together. Neither one was aggressive towards the other...then the male arrived and nudged the visitor and off she went, to perch in a nearby tree. Worth a try I guess! "I'm sure I saw at least 30 ospreys. I saw ospreys eating fish, ospreys looking at cars, ospreys looking at each other, ospreys looking toward the lake, ospreys enjoying the sun... I saw lots and lots of ospreys! " So they are truly on their way! I have never seen that many ospreys in one place so this may be a result of the stalled migration. Very interesting!!!! What a year. Another long day checking osprey nests. I covered 145 miles and 12 nests. Nine had at least one bird...most had two and one had four of them flying and fighting for the territory. A few were still empty. I saw quite a few skirmishes with bald eagles. Did you know that ospreys have a very specific and unique alarm call for "bald eagle". Not like their all purpose alarm call. I heard it quite a few times today. I found a goose had taken over an eagle nest too...glad they are not just picking on the ospreys. Such a sight! I also found an osprey that seems to have some sort of eye injury. He would not open one eye. It is troubling but he is flying well so can't be caught easily. I wonder how he manages to fish. I will keep checking on him. I am hoping it's something minor that will heal. Lots of copulating going on out there. 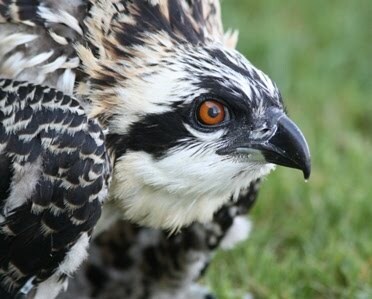 Last year at this time, and most years at this time, we have had ospreys sitting on eggs. I have found none yet. I read 5.5 bands today...we have some new birds showing up. I also saw a number of what we call "floaters"...a single bird perched somewhere that is not near a nest. So that's the news for today. For those of you who are wondering where our missing Ospreys are...check out this radar. Those blue circles are migrating birds which are stalled south and east of us. These cold fronts are keeping them from coming home. They will get here eventually. What a weird spring. Finally a day that is not raining or snowing! I checked 21 nests...different nests than last Sunday. I found 5 nests with a pair present and two nests with a single osprey. I read five new bands. On one nest I found the female from past years with a totally new and younger male. She was just food begging as he rearranged sticks. This is the nest where I saw the pair of geese last week. This young male sat down, as if incubating, several times. Sometimes an osprey will do that in preparation for egg laying, as if he were testing the nest cup for comfort. Each time he got up tho and moved sticks. Could there be a goose egg in there? Hmmmm. What's more interesting is that after about 20 minutes, another male arrived and chased this young male away. It was the older male from past years. Interesting that the female did not suggest that the young fellow leave during those 20 minutes! The older male immediately copulated with her, of course. A short distance down the road I found a goose in another osprey nest...is this the same goose that was chased away by the ospreys above? Perhaps. Yes, life is interesting this time of year. Here is my update for today...I checked 23 nests in the snow/sleet/ rain. Had some good strong coffee and a very buttery croissant to fuel the excursion. I only found two nests that had a pair present and two nests with a single bird present out of that 23! Overall this week, me and my wonderful volunteers have seen single birds on 11 nests and pairs on 12 nests. We have read 8 bands. Keep in mind that with this odd spring, with so many lakes frozen, the timing of our nest visits may affect what we see. Many birds are traveling a distance to find fish, so they are unable to stick as close to the nest as they normally would, if their local fish market were open for business. Many nests remain empty, and this data will surely change on a daily basis. But we will keep checking, documenting and this will add to our understanding of these birds and the environment. Stay warm. I checked 19 nests today...found a pair of ospreys on two nests and single birds on 5 nests. Unfortunately I also found a nest occupied by a pair of geese that are incubating. Darn it! But this has happened before, it's becoming a regular thing now...at least one nest every year. I hate to see the ospreys displaced but we will watch and see what happens. The ospreys will probably find another nesting spot nearby. Would love to be there to see how they react when they return! Can't remember if I have told this story here before, but many years ago some geese tried to take over an osprey nest. When the ospreys returned they managed to chase off the geese.The osprey laid their eggs and one day a neighbor called me to report that the osprey chicks were hatching...but I knew they had not incubated long enough so it was not possible for hatching to have occurred. They insisted they could see a little yellow chick up there. But osprey chicks are not yellow! So I ran out there and discovered the ospreys had hatched a gosling! Apparently the geese had left an egg behind. As many of you may know, waterfowl eggs are a little different than raptor eggs. Geese and ducks can lay many eggs and do not begin incubating until they lay the last egg. The eggs can survive a period of time without incubation. However, ospreys begin incubating when they lay the first egg, otherwise the eggs may die. It was an amazing thing to watch, as they tried to feed it fish and the gosling crawled all over mama osprey and snuggled beside her. They never displayed any hostility towards this odd creature. On day four however, the gosling disappeared...either died of starvation or dehydration, or it jumped off the nest to go be a goose (tho it would have been imprinted so the outcome would not be a happy one for that little guy). I checked 13 nests today and 3 yesterday...no ospreys seen. But the migration radar indicates there are a lot of birds on southern Minn and Iowa. Thanks for all the emails from volunteers telling me....well, nothing! But seeing no birds is also valuable information. Patience! This time of year is interesting...when a female returns to her nest before her mate, she may engage in copulation outside the pair bond. I have documented quite a lot of this in banded birds. It was previously believed that they "mated for life", but it is actually fairly common for them to engage in extra pair copulation and I believe there may be mixed paternity in a brood. The females who wait for their mate from the previous year to return, do not know if their partner survived migration and the urge to get their eggs fertilized and to breed is a strong one. I have also documented "divorces" ...a term that is anthropomorphic, but explains to people that pairs do split and seek another mate, usually after a failure to breed successfully the prior year. My first observation regarding extra pair copulation was many years ago when I was watching a nest that had our oldest male on it. His mate returned and was seen with him on the nest but within a few days of her return, I found her on another nest copulating with another, younger male for about a week! Then she returned to her nest with the older male to lay her eggs! She had failed to successfully produce chicks with the old guy for several years, so this clearly was her way to improve the odds of producing fertilized eggs! The older male was a good provider, however, which may be why she remained with him. Interestingly, they produced three chicks that year, but they were predated. The following year she "divorced " the older male and moved in with the younger male.